This was typical of the Huffington Post’s anti-Semitism, which is receiving fresh scrutiny after CNN fired Marc Lamont Hill after his repeated justification of Islamic terrorism against Jews. Not only did Huffington Post fail to end its ties with a supporter of murdering Jews, but it justified his hatred by running two pieces falsely claiming that he was fired for criticizing Israel and supporting Palestinian “equality”. Hill had also celebrated cop killers, an anti-Semite who called Jews “bloodsuckers” and a radical who claimed that the Americans murdered on 9/11 had it coming. The Huffington Post is owned by Verizon. 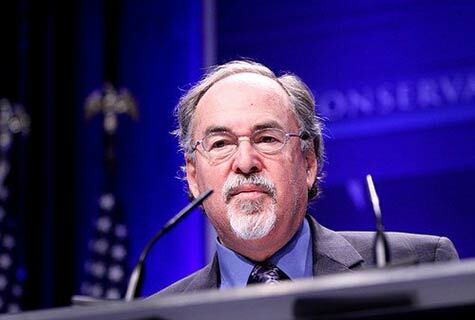 While Verizon has no problem with rhetoric supportive of murdering Jews or 3,000 Americans on 9/11, the monopolistic telecom that dominates the marketplace does have a problem with David Horowitz. In a confusingly misspelled response, Verizon declared that it “has no tolerance for racist, white supremacist or sexist comment or ideals”. And then it departed ALEC in solidarity with the Muslim Brotherhood, Black Lives Matter and other racist, sexist and anti-Semitic organizations. AT&T just acquired CNN which fired Marc Lamont Hill, but refused to condemn his anti-Semitism. AT&T has also failed to condemn Hill’s calls for the murder of Jews, the way that it condemned Horowitz’s criticism of the anti-Semitic hatred of Black Lives Matter and the Muslim Brotherhood. Verizon and AT&T made their statements denouncing Horowitz and ALEC to The Intercept, a notoriously anti-Semitic site whose co-founder, Glenn Greenwald, defended Hamas and Hezbollah, claiming that they are “dedicated to protecting their citizens against the State of Israel”, and who defended Hill. A former Intercept journalist had even phoned in death threats to Jewish community groups. While AT&T and Verzion refuse to be a part of ALEC because one speaker’s reference to Islamic radicalism offended them, they are happy to collaborate with anti-Semites and Hamas supporters. But the real issue goes far beyond Horowitz. It’s about the transformation of America’s economy from a dynamic free market jungle of aspiring business to an oligarchy of leftist monopolies controlling every aspect of our lives. ALEC’s motto of limited government and a free market still serves most of the companies and legislators who participate in it, but it increasingly doesn’t serve the megacorps. It’s no coincidence that Verizon, the largest wireless company in the country, and AT&T, the second largest and currently battling efforts by the Trump administration to prevent its Time Warner merger, were the ones to withdraw from ALEC. DowDuPont, the afterbirth of another monstrous merger that turned it into the world’s largest chemical company, is also reported as having departed ALEC. In the past, progressives had fought monopolies while conservatives had argued for laissez-faire. But under Obama, corporate mergers had boomed as a new generation of radicals realized that a handful of monopolies could more effectively control the country by bypassing traditional constitutional and democratic roadblocks to eliminating the Bill of Rights and imposing radical policies in the heartland. Why bother trying to have an extended battle over the Second Amendment when you can just use a handful of financial corps to impose gun control on businesses that sell firearms? That’s just what Bank of America and Citigroup did. Want to censor free speech? Don’t bother with the First Amendment, just do it through Twitter, Facebook, Google and Amazon. You can have your free speech in legal theory, but not in practice as online censorship shuts down individuals and sites guilty of “problematic” speech. ALEC represents the traditional free market approach. But the big boys are going another route. The merger of leftist politics and big business monopolies is creating a new political and economic oligarchy that isn’t satisfied with mere economic dominance, but also imposes its political agendas. Megacorps take in political activists to set policy for them, kicking back money to leftist special interests, advocating and imposing lefty policies on local areas, and winning freedom from regulatory oversight. This dirty deal between radicals and monopolists is the greatest domestic threat to our freedom. ALEC has long been a leftist target because it lobbied for a free market. But it’s also becoming a target of the monopolists who don’t want a free market. They want to win by ending free market competition. Between them, AT&T and Verizon’s wireless arms boast over 300 million customers. That’s nearly the population of the United States. AT&T’s Time Warner merger isn’t the end of the line, it’s the beginning. The mergers will continue until the country is left with a handful of corporations in complete control of the economic, social, political and cultural infrastructure of everyday human existence. Those corporations will define what is allowed on the internet. They will determine what you can buy and see. They will decide what news you can read and who gets elected. They will have final veto power over policies in every state, municipality and community. And no amount of elections will matter. This is not a fantasy of the distant future. It’s happening right now. Corporate internet censorship has hit unprecedented heights. The number of people being ‘deplatformed’ for political offenses continues to grow every year. Corporate financial penalties have been used to pressure businesses to violate the civil rights of their customers for political reasons, and to compel states and communities to drop laws that offend the political views of the oligarchy. As David Horowitz’s story shows, this political censorship may be officially carried out in the name of fighting hate speech, but is actually used to support the most hateful speech imaginable. The two biggest wireless providers in America came after David Horowitz in support of two racist and anti-Semitic movements, while their own companies continue airing racism and anti-Semitism. It’s up to conservatives to decide if they want to live in a free country, or in Verizon and AT&T’s world.